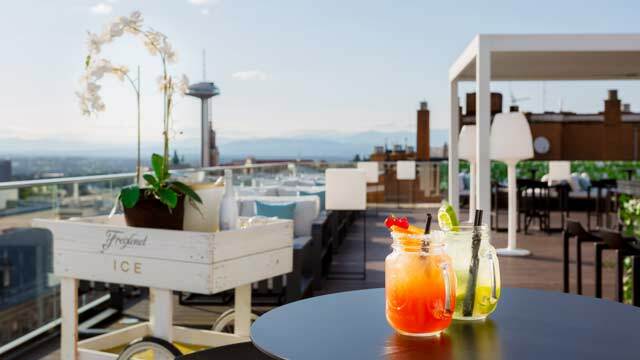 The ultimate guide to the 15 best rooftop bars in Madrid in 2019. Get all info you need from 15 of the best roof terraces here. Complete with opening hours, dress code, pictures, maps and much more. Madrid is one of the most vibrant and lively cities in Europe. 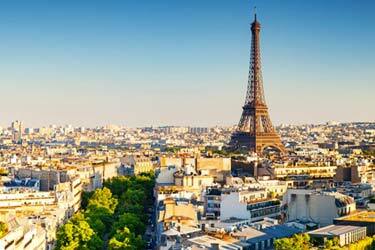 The large number of bars and restaurants helps to rise the nice atmosphere. And the same goes for the rooftop bars here. Most of them located at hotels with fancy rooftop pools. 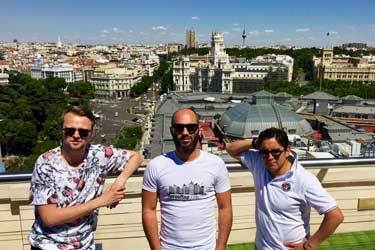 So, which is the best rooftop bar in Madrid? 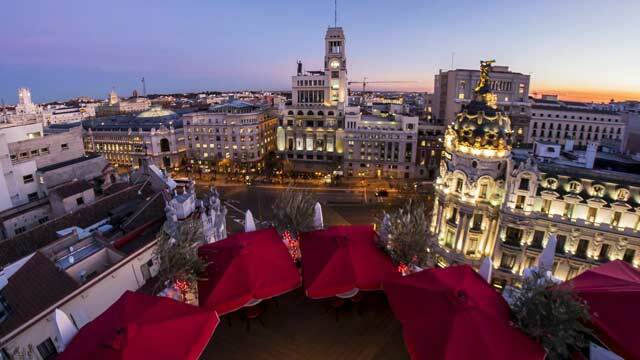 Just scroll down and find the Madrid rooftop bar best suited for you. Or use the Madrid rooftop map in the bottom right corner. 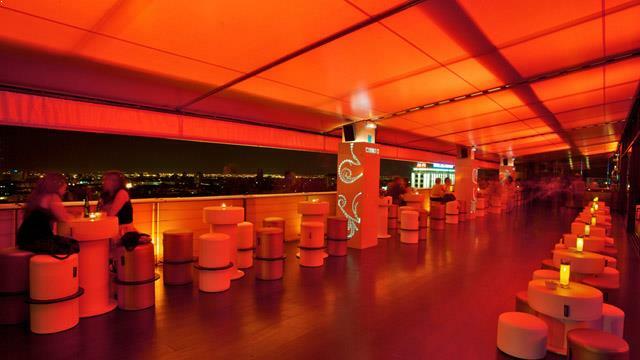 From this modern and luxurious rooftop bar you get an amazingly beautiful 360-view of Madrid and its surroundings. Located in the heart of the city and close to Gran Via. The terrace is equipped with cozy lounge furniture and Balinese beds, along with a beautiful rooftop pool. The pool is open daily in summer, while the terrace and rooftop bar is open nightly year around, offering a wide variation of crafted cocktails in a vibrant lounge atmosphere. 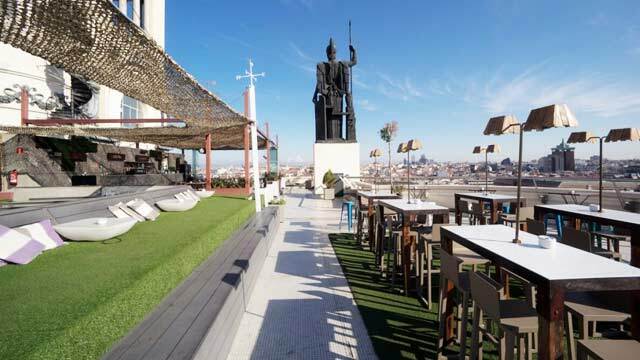 One of Madrid's best rooftop bars, with a central location, fantastic views and generous opening hours. From the roof terrace you get an absolutely stunning 360-view of Madrid's skyline. Here you find a fairly new restaurant that delivers great Spanish and Mediterranean food throughout the day, and a rooftop bar offering all the classic drinks in form of wine, beer, sangria, champagne and cocktails. All to very reasonable prices, and well forth the 4€ elevator fee. 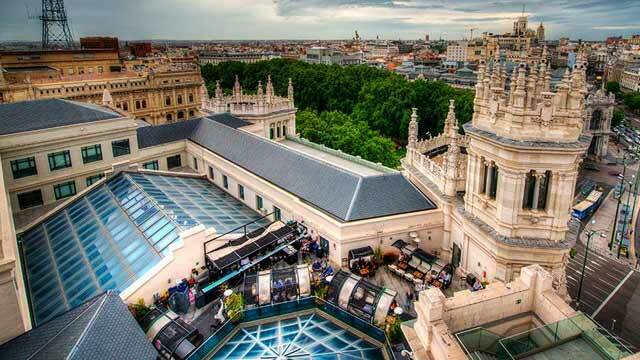 If you are searching for Royal Palace views, this is the rooftop bar in Madrid to visit. Here you get fantastic sunset and night time views over the Sabatini Garden, the palace and as well over the Madrid skyline. To this you can enjoy tapas and drinks at very reasonable prices, with a glass of cava at 5€. A garden lounge feeling and relaxed atmosphere surrounds the Sabatini roof terrace, which is not huge and only open later at night, so booking in advance is highly recommended. 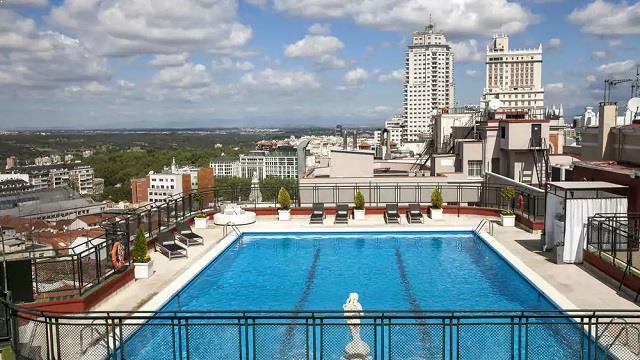 Check out our list of the best rooftop pools in Madrid. Some amazing swimming pools with dazzling city views. Don't miss out on this when visiting Madrid! A restaurant and bar, situated over three stories, where the cozy and small rooftop garden on top is the prime spot to visit. Located in the Latina area of he city, the kitchen on the terrace serves a nice selection of tapas and nibbles, along with crunchy pizzas and the rooftop bar offers a wide selection of cocktails, where (of course) the mojito is a given favourite. Expect cool views over old town Madrid, a magical sunset accompanied with a vibrant and relaxed atmosphere. A unique concept, with a fitness club, a theatre, a restaurant and a rooftop terrace, all in the same building. 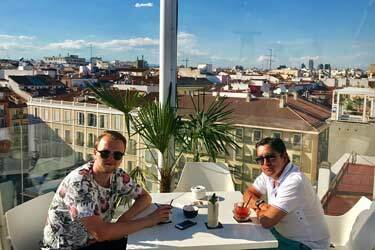 Add a fantastic rooftop pool and some great views over the streets of Malasana and you see why this is a fantastic rooftop bar in Madrid. From the rooftop bar you can order cocktails, coffe, shakes and smoothies all day long, along with a fine selection of tapas, burgers, sandwiches and so forth. During summer you can also pay a fee and enjoy a relaxing day of sunbathing and swimming in the rooftop pool. 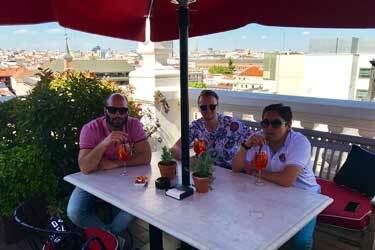 There are note many rooftop bars in Madrid that can boost of with such an amazing terrace as The Hotel Emperador. Located right in the city center, at the famous street Gran Via, and here you'll find a rooftop swimming pool, sun loungers, Sky Cocktail Bar and lounge areas for socializing. Beachclub and the pool is open daily during May - Sep, free for hotel guests and open for non-guests as well for a fee. And then there is the Sky Bar, open year round for everyone, serving crafted cocktails. 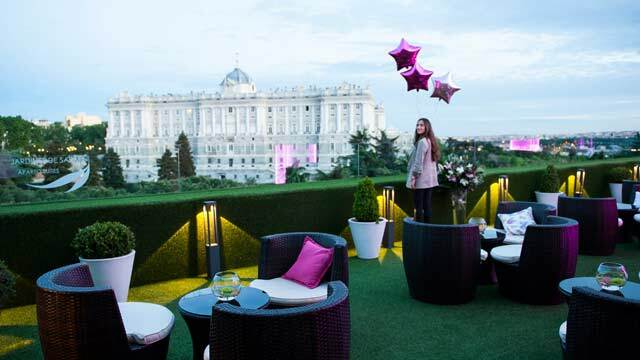 A rooftop terrace in Madrid with spectacular 360-degree views over all of Madrid and it’s surroundings. 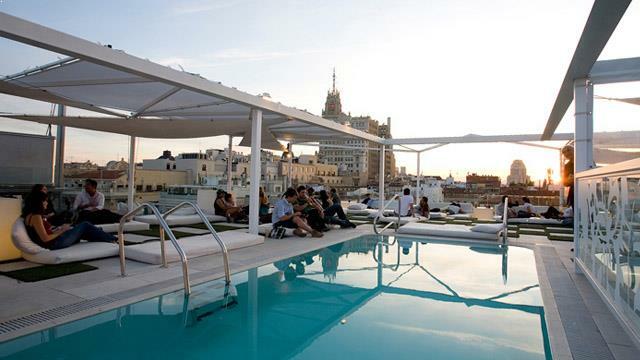 Fot hotel guests, the rooftop holds one of the best rooftop pools Madrid has to offer. Non-guests can instead visit the Nice to meet you Restaurant & Lounge, located on the same floor. A perfect rooftop bar and restaurant for both a sunny lunch, evening cocktails, dinner or just ejoying the sunset and weekend live DJs. 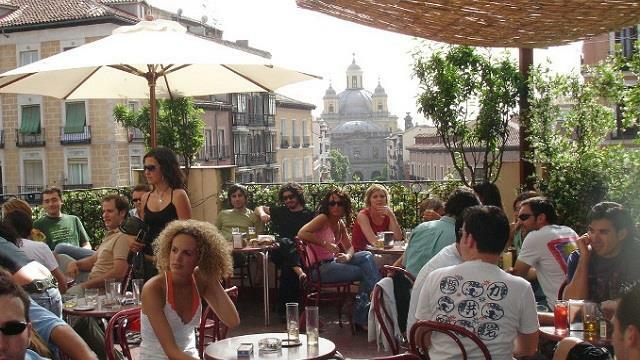 A very popular rooftop bar located in central Madrid, close to Puerta del Sol. With cool views over Madrid, and a calm and relaxed atmosphere, this is a prefect place for some summer cocktails with a luxurious touch. The rooftop bar serves well made signature cocktails, a variety of Gin & Tonics, a good set of non-alcoholic cocktailsalong with different tapas and bar bites. The service is great and the setting very stylish and chic. Radio rooftop bar was recently refurbished and got a more exclusive edge, and have quickly become one of the hotspots of the city. Here you get a nice and relaxed lounge feel during the afternoon / early night, and later at night the party vibe rises, with DJs playing and the stylish people enjoying. From the terrace you get a panoramic 360-degree views over all of Madrid and can enjoy a great selection of cocktails and classic Spanish tapas. From SkyNight you get a wonderful panoramic view of the skyline. The roof terrace is Jean Nouvel-designed and has a cool and stylish touch on both the bar and interior. Opening first at 9PM, so really a fashionable night spot. More of a balcony feel than that complete open air rooftop, here you can enjoy creative cocktails and live DJs playing tunes that could take you all the way to the dancefloor, but still not blasting it so it's possible to just enjoy the vibe and have a conversation with your company. 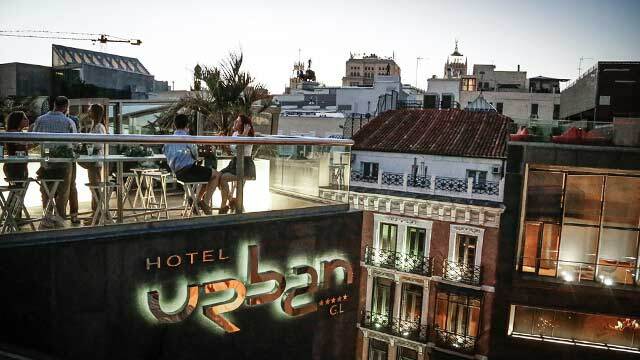 A very stylish and modern rooftop bar, located at the 5-star Principal Madrid Hotel, right in the center of Madrid on the corner of the famous Gran Via. Classic setting in a garden like enviroment with olive trees and cypresses and with a spectacular view of the city skyline. The rooftop bar offers a good selection of classic cocktails, creative creations and a wide set of Gin & Tonics. Known for both great service and atmosphere, this rooftop is perfect for a relaxing drink both day and night. Situated on the roof of the shopping center El Corte Inglés you will find this great rooftop bar. Or more precisely, it is a delicatessen market / restaurant area, where you can choose from a range of small gourmet restaurants, order your food and drinks and bring it out to the terrace. 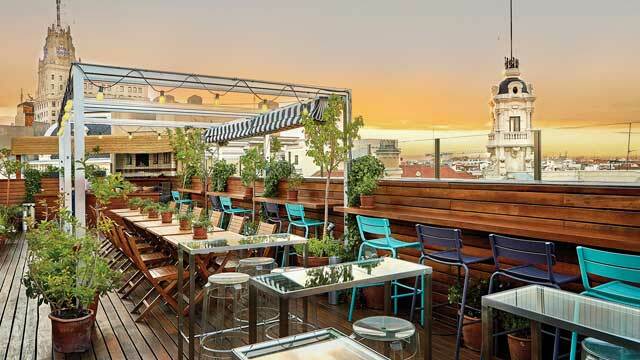 Great views of the Capitol Building and the main shopping street Gran Via, with food and drinks that ranges from Mexican and Japanes to classic Spanish, this is the perfect rooftop for a shopping break and enjoying the views. This venerable rooftop is located on the famous Plaza de Cibeles, on top of the beautiful building Palacio de Cibeles. The rooftop bar offers a wide variety of crafted cocktails, wine, champagne and sharing plates to keep the stomach happy. Open from mid-day to late at night, this is a great place for both a cocktail in the sun and night time mingling to the Madrid skyline. Usually a great atmosphere and always perfect place to get som magical photos of Madrid. Sky Moncloa is located on top of Hotel Exe and is nicknamed 'the Terrace of the Setting Sun'. As you can imagine, pinpoint a sunset and the views over Madrid are absolutely stunning. Very nice rooftop pool available for hotel guests during the day, then at night it turns into a rooftop cocktail bar, open for everyone. With a vibrant and relaxing ambience, the rooftop bar serves a wide variety of cocktails and drinks along with salt and sweet snacks. Perfect rooftop to visit for a pre- or after dinner cocktail. Ático 11 is a green and cozy oasis, located right in the city center on top of Hotel de las Letras. From the terrace great views of the capital and the rooftop bar offers a selection of good tapas and very nice cocktails. They are particularly known for their Mojitos and Gin & Tonic. The terrace is quite small, but both authentic and charming. The service and atmosphere is usually on top, and later at night the music sessions turn up the vibe even more. Discover the biggest collection of Madrid activities, guided tours and skip-the-line tickets. Anything you want you'll find right here. The climate is pleasant all year round, except for 1-2 months in the winter. So the rooftop bars in Madrid can be visited almost all year round. The terraces here are often located on the roof of some hotel and with magnificent views of the city and its surroundings. When you don´t enjoy cava and beer at one of the rooftop bars in Madrid you should watch some soccer, preferably the team Real Madrid who plays at the Santiago Bernabeu. The stadium is located right in the city center and here you can watch some of the best soccer matches in the whole world. If you want to get the most out of your stay in Madrid, you should visit one of the city's rooftop bars in the day, followed by a Real Madrid game and finally a good tapas dinner in the older areas of the city. Almost all Madrid rooftops are located down in the city center within walking distance from the terraces. Most adjacent to the graceful main street Gran Via. Although the roof terraces are quite close to each other, the view here can differ pretty much. There is a good range of roof terraces in Madrid, but given the city's size and climate, then it should be more nice ones, one might think. And regarding the big interest in rooftop bars we would not be surprised if it turns up a lot of new places to drink with a view in the near future. The typical Madrid rooftop bar is located at a luxurious hotel or on top of a restaurant, with a majestic view over the city. 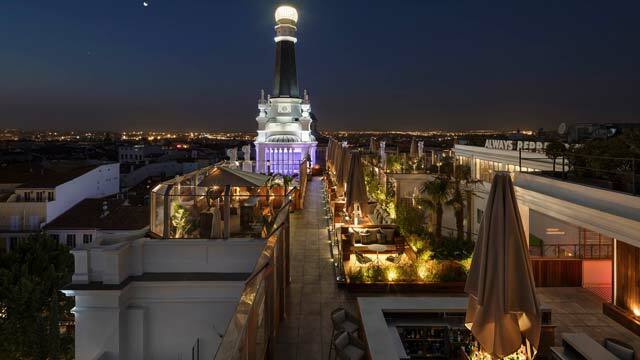 Which are the best rooftops in Madrid? 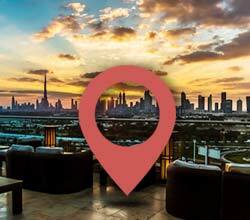 At our website you will find the best ones closest to your loaction with the help of our rooftop map. Madrid is Spain's biggest and the EU's third largest city. 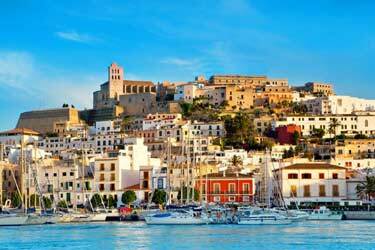 The city is also the capital of Spain and the financial and cultural center. 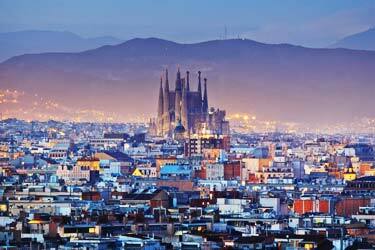 Madrid is packed with small bars and cozy restaurants with tapas of the highest class. Madrid is a city with lots of restaurants and bars that have a fantastic wide and good selection of various food and drinks. The same applies to the rooftop bars in Madrid. In addition to classic cocktails you can find lots of nice wine, cava or beer on the roof terraces here. As for food, it is very clear that tapas dominate. In Madrid, one can eat authentic tapas made in an authentic Spanish way. 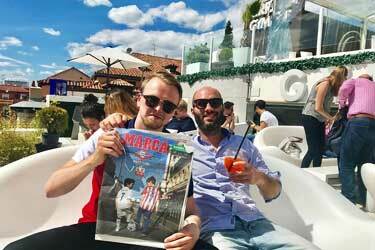 For those who like party, the rooftop bars in Madrid is not that particular party friendly. Here you can relax more and enjoy the view and the good food and drinks. If you want to party, it is better to do it at one of the city's nightclubs after you have been on the roof terraces. 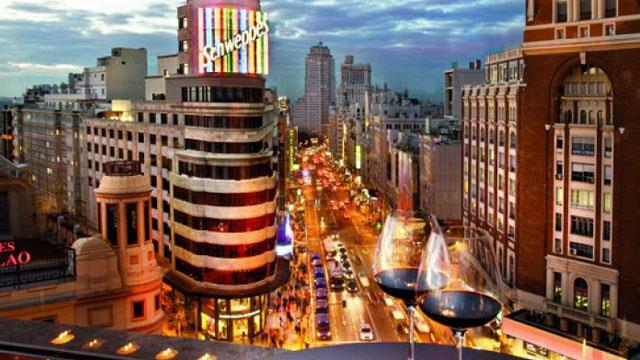 Madrid is built in a classic European way, with a fairly dispersed and low construction center. Despite this, one can get absolutely stunning views from many of the roof terraces here. Some of the rooftop bars in Madrid has outstanding 360-degree view while others have a little less grand views over the city's rooftops. For those who like rooftop swimming pools in Madrid, there is a really good one here. 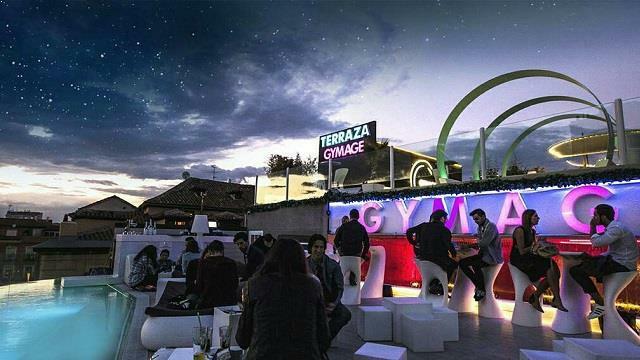 Up on the La Terrazza Oscar you can swim to the views of Madrid's skyline. When you get some free time over between visiting the rooftop bars in Madrid, there is a lot of fun and interesting things to do in Madrid. 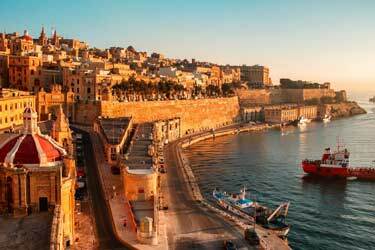 The very best is to stroll around the city's streets and visit all the small cozy cafes and bars. Grab a cup of coffee or a beer and some tapas in each place you visit to get the most comfortable experience. If you want to be a little more cultural, you can visit any of the city's museum, such as the Prado Museum, where you can find fantastic art from some of the world's most famous artists. As in most other big cities, there's also a good selection of shopping with an entire street where you can find all the big brand stores. There is also a large urban park - Retiro - which is great to go to if you want a bit of harmony and relaxation. 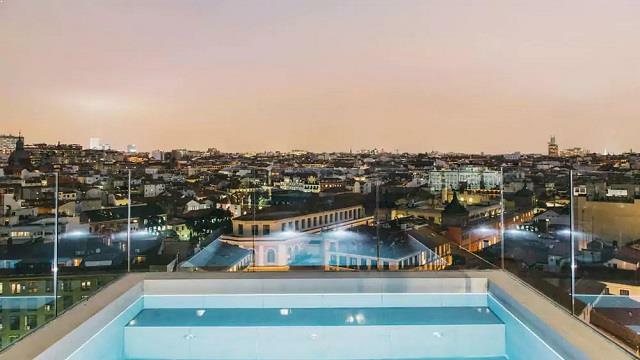 Despite its warm climate and relatively large amount of rooftop bars, there is unfortunately not a huge variety of rooftop swimming pools in Madrid. The few rooftop swimming pools available in Madrid is however of very high class. From the roof terraces swimming pools you get quite magical views of Madrid's skyline and surroundings. 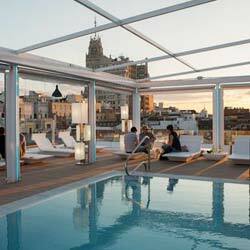 If you want to get an extraordinary rooftop experience in Madrid you should book hotel where there is a rooftop pool. With us you will find the best prices and offers on the market when it comes to hotels in Madrid. Do not miss the chance to experience the luxury with a rooftop pool. Madrid Barajas Airport is about 20 minutes by taxi from the city center, making it easy to get here. A lot of flights from Europe land here every day while it's not quite as much air traffic from other continents. In Madrid there are plenty of good hotels. Both for those who want super luxury or a bit simpler and cheaper alternative. Many tourists who come to Madrid are here to watch football, so hotels near the arena Bernabeu usually are very popular. Some of the city's hotels are equipped with nice rooftop bars that can be used by both hotel guests and visitors.